U.S. start-up airline “Moxy” confirms order for 60 Airbus A220-300s. The start-up U.S. airline code-named “Moxy” has signed a firm order with Airbus to purchase 60 A220-300 aircraft. Moxy is the new airline venture led by David Neeleman, one of the industry’s most innovative entrepreneurs and founder of JetBlue Airways. In addition to JetBlue, Neeleman also founded Azul Brazilian Airlines and is the controlling investor in the revitalization of TAP Air Portugal. Plans for Moxy, a low-cost airline were unveiled at the Farnborough International Air Show in July. “The A220-300 is the right airplane for a new airline that will be focused on passenger service and satisfaction,” said Neeleman. “With a low cost of operation and spacious cabin, the A220 will allow us to provide passengers with lower fares and a high quality, comfortable flying experience. The A220’s ability to operate profitably in thin, underserved markets across a broad spectrum of ranges is unique”. The order was completed the final week of December. 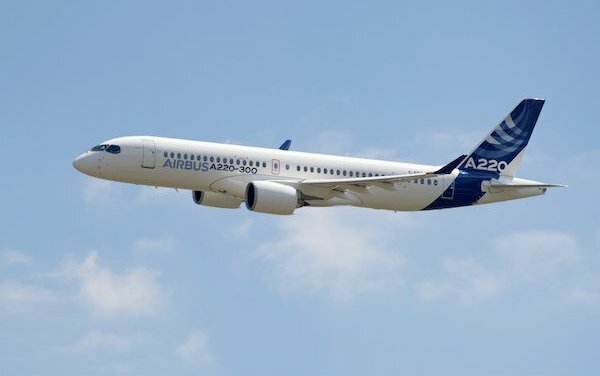 Airbus will produce the A220-300 at a new U.S. assembly facility in Mobile, Alabama. Construction of that plant, to be located adjacent to the existing Airbus A320 assembly facility, will begin later this month. The A220 is the only aircraft purpose built for the 100-150 seat market; it delivers unbeatable fuel efficiency and true widebody comfort in a single aisle aircraft. The A220 brings together state-of-the-art aerodynamics, advanced materials and Pratt & Whitney’s latest-generation PW1500G geared turbofan engines to offer at least 20 percent lower fuel burn per seat compared to previous generation aircraft. With a range of up to 3,200 nm (5020 km), the A220 offers the performance of larger single-aisle aircraft.